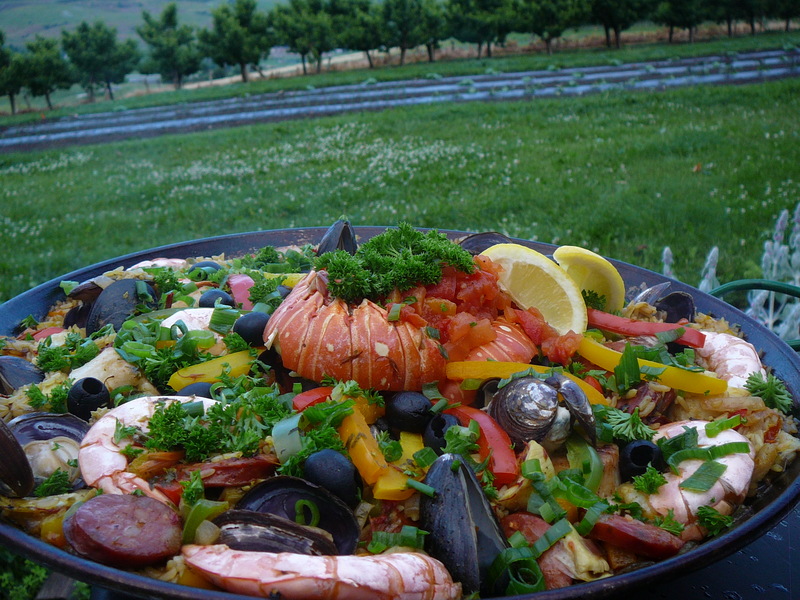 The seafood paella is so versatile, and can easily be transported between economy and luxury depending on what type of seafood you use. This version is top of the line! Nothing but delicious fresh shell fish, and some chorizo sausage for that little bit of heat. In paella pan (or other flat saute pan that can go in the oven) heat oil and saute onion until soft, add garlic and chorizo sausage. Stir briefly then add dry rice. Toast rice lightly and continue to stir. Add saffron threads, turmeric and herbs to chicken stock. Add chicken stock one cup at a time to rice mixture, allowing rice to absorb liquid before adding more. Once you have 3 cups chicken stock introduced and the rice is starting to soften, add the artichokes, sun dried tomatoes and olives. Stir well, and gently nestle the seafood in – pushing the shells deep into the rice so that it is almost covered. Reserve the lobster tails to arrange last. At this point most of the liquid should have been absorbed so you can add the last bit of chicken stock. Arrange the strips of colored peppers in a pinwheel on top of the paella – cover with tin foil and allow to finish in the oven – about 20-30 minutes. While paella is in the oven, diced the tomatoes and warm gently in a saucepan. Test for doneness with a fork – gently scoop out some rice and if it is cooked through take a peek to make sure your shells have opened – this should be all the cooking time the fish needs. The shells are incredible when they fill with the rice mixture hiding the little nugget of a clam or mussel. Remove from the oven, pile your cooked tomatoes in the center of the dish, and scatter parsley and green onions over top. Make sure to serve with lemon wedges – encourage everybody to squeeze lemon on their serving – it really brings out the flavour. Have a spare empty bowl at the table for all the shells. 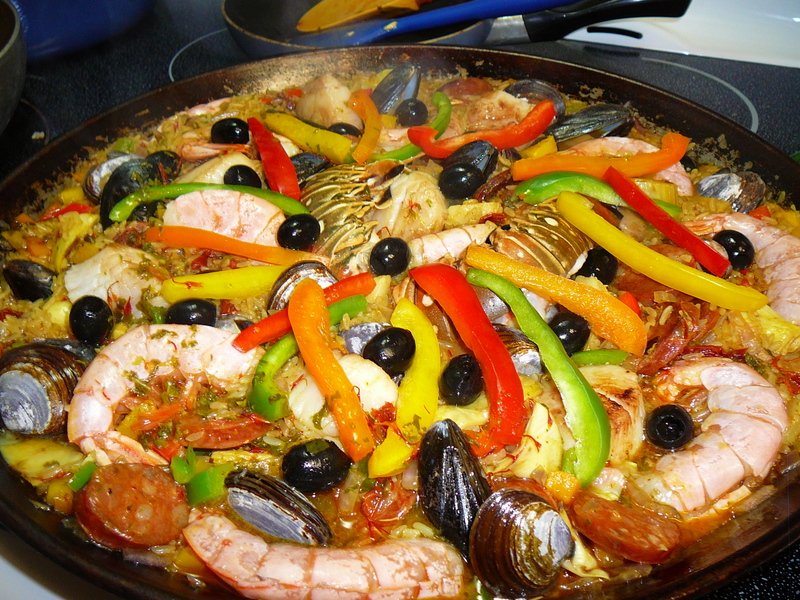 This entry was posted in Beef and Pork, One Dish Wonders, Recipes, Spanish and tagged artichokes, black olives, paella, rice, saffron, spanish, sweet peppers, tapas by Chatty Kathy. Bookmark the permalink.